Kingscrest Cavern is a large cave north of Cheydinhal containing monsters. It contains four zones: Kingscrest Cavern, Kingscrest Cavern Chert Galleries, Kingscrest Cavern Basin Chambers, and Kingscrest Withered Forest. This cave contains 20 Cairn Bolete plants and 75 Wisp Stalk plants. It is possible that Lady Rogbut gra-Shurgak will hide here during the quest The Noble's Daughter if she is chased by the ogres. Standing on Dive Rock will add a map marker for Kingcrest Cavern. 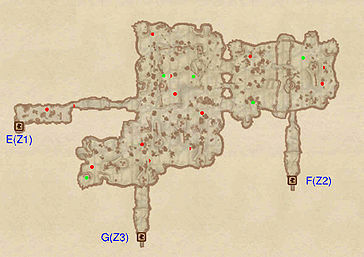 Kingscrest Cavern also appears in ESO. 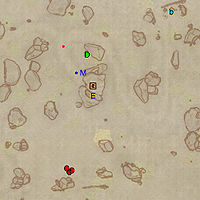 This location's map marker (M on map) is named Kingscrest Cavern (editor name KingscrestCavernMapMarker). The entrance door is SE of the marker, 40 feet away. This zone contains four doors, one leads to the wilderness, door C leads to Kingscrest Cavern Chert Galleries, door D leads to Kingscrest Cavern Basin Chambers, and door E leads to Kingcrest Withered Forest. 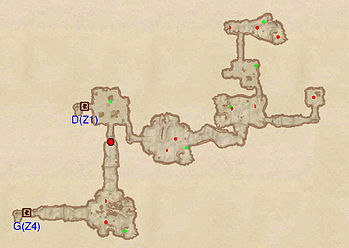 Entering this zone from the wilderness places you in a room with one definite enemy, one possible enemy, and one minor loot chest to the right of the entrance. There are three passages in this room, one to your left, one to your right, and one in front of you. Both the passages to the left and to the right of the entrance lead to rooms with one definite enemy inside and one possible enemy, and then to a small room containing the door to either Kingscrest Cavern Chert Galleries or Kingscrest Cavern Withered Forest. The room with door E contains a minor loot chest. 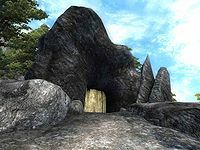 The passage in front of the entrance of Kingscrest caverns leads to a room with one enemy in it and also door D to Kingscrest Cavern Basin Chambers. There are two doors in this zone, door C Kingscrest Cavern, and door F leads to Kingscrest Cavern Withered Forest. This zone is a ring with both doors on opposite sides of the ring, so neither door is favored over the other to enter from. 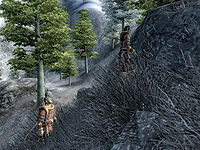 If you enter this zone from door C, you can take a left, which leads to a room with two enemies and two minor loot chests, or go straight ahead, which leads to a room with one enemy and one minor loot chest hidden in a nook to the left of door C. Proceeding down the connecting tunnel attached to this room leads you to one enemy and a room with a minor loot chest in a rut if you continue on further. Taking a right from the previous connector tunnel leads into a large connecting tunnel, and later into a room with 3 minor loot chests and an enemy in it. The next room is quite large, and contains three enemies, a minor loot chest in the far left corner, and a passageway leading to door F in the basin at the middle of the room. Proceeding straight from the minor loot chest leads to a large tunnel that intersects another tunnel. At I, there is a trip wire that activates the log trap at H. Do not forget to claim the loot chest behind the logs at H before you move on in the dudgeon. The room after the tunnel intersection contains a minor loot chest and an enemy. The next room is the one adjacent to door C, which puts you back near where you began. There are two doors in this zone, door G leads to Kingscrest Cavern Withered Forest, while door D leads to Kingscrest Cavern. 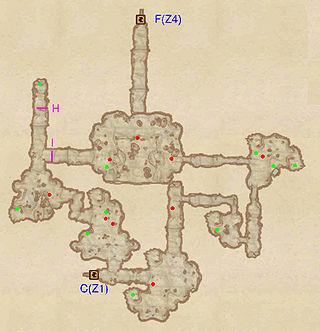 If you enter this zone from door D, you will come into a small room with a minor loot chest in front of you, and possibly an Orc Adventurer to your right at O if you go down the path at O, you will come to a slightly larger room with one definite enemy, one possible, and a minor loot chest between rocks at the back left corner of the room. The passage that contains doors G branches off from this room, but entering Kingscrest Cavern Withered Forest from this door is dangerous because you will have to go through a fairly long underwater passage before reaching the main room of Kingscrest Cavern Withered Forest. If you had taken the other path in the room with door D then you will come to another room with one possible enemy, one definite enemy, and a minor loot chest to the left of the large tunnel leading to the next room. This room contains two possible enemies and a minor loot chest in front of the connecting passage's opening. There will be a path to the right of this opening, but it is not recommended that you take that path, as there is an enemy there and no treasure to be gained. Proceeding straight from the opening leads to a room with a minor loot chest in the right corner. 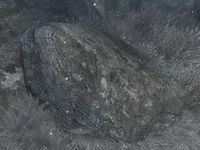 There is a small connecting tunnel that leads to an offshoot of the cave, with two enemies, and a minor loot chest. This zone contains three doors, Door E leads to Kingscrest Cavern, door F leads to Kingscrest Cavern Chert Galleries, and door G leads to Kingscrest Cavern Basin Chambers. This zone contains extensive underwater areas, and water breathing is highly recommended because the water is quite murky, and because there is loot located in the water near the passage that leads to door G. Both doors G and F are in submerged passage ways, so if you don't have water breathing or a high speed then it is recommended that you enter this zone through door E, starts you on dry land. 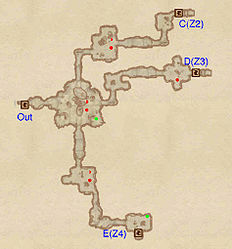 If you enter this zone through door E, you will enter a room with an enemy in it, which also leads to the main chamber of Kingscrest Cavern Withered Forest. The main room has trees interspersed above and below the water line, which can make combat difficult for archers. 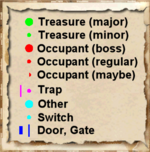 To your left will be a pool of water containing two minor loot chests as well as the passage to door G. To the right of the passage from door E are two definite enemies and two possible enemies, in addition to a minor loot chest in the back corner. If you proceed straight from the corridor from door E, you will enter an offshoot of the main chamber. This room contains two enemies and a possible enemy, and two minor loot chests. Both minor loot chests in this room are above ground, the first being straight ahead from the passage from door E in a puddle, while the other is on the opposite side of the water that divides this room. Below this water is the passageway leading to door F.
1 door (at E) leads to the zone Kingscrest Cavern. 1 door (at F) leads to the zone Kingscrest Cavern Chert Galleries. Water breathing magic is highly recommended. 1 door (at G) leads to the zone Kingscrest Cavern Basin Chambers. Water breathing magic is highly recommended.